What is your favorite season? Do you like the frigid cold of winter or the sweltering heat of summer? Mine? My favorite is Fall. I love that there are days where I can walk out in a knee-length skirt and flip flops and feel great. Then, there are other days where I throw my boots on over my jeans and pull on a sweater. I love that cool crisp air and the wandering smells of a fire. I love soups and warm casseroles out of the oven. I love spending a Friday night at a football game and Saturday afternoons enjoying the weather. Plus the nerdy part of me always loved the start of a school year – new beginnings, fresh energy. I just love Fall. Well, I can at least say my Fall decor is up and I am loving it! 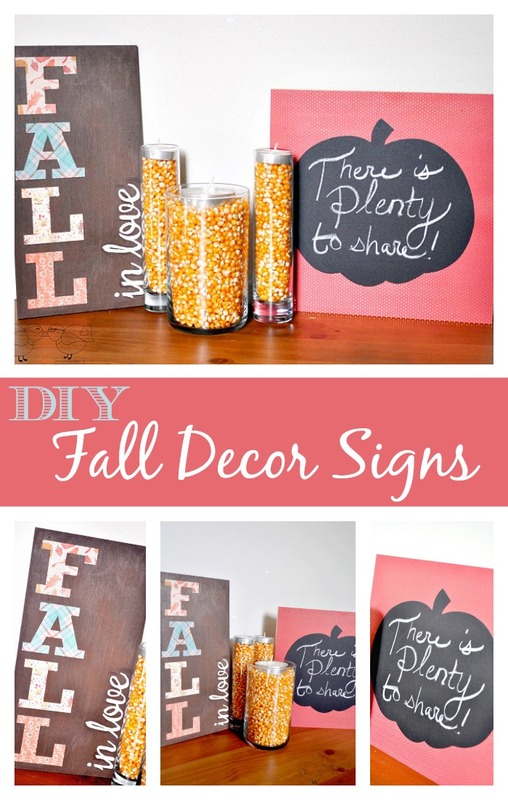 I shared a sneak peak on the blog a couple weeks ago, so I thought I would revisit a couple of the DIY Fall Decor Signs I made with all of you today because they were overall simple projects. The big harvest sign I made? That took time and patience. These two smaller signs were the easiest to make and are totally my favorite. Plus, even if you don’t design for fall, these techniques can be modified in the future for other seasons, parties and holidays. Chalkboard is still totally in – or isn’t it? I am horrible at staying up with the fads, but I do love chalkboard in small doses because of it’s fabulous texture. It adds a richness to a project that you just don’t get from other materials. For this project, I went easy and bought pre-cut chalkboard pumpkin stickers. Yes. They sell those. Head to Joanns or possibly Michaels/Hobby Lobby, and see if they have these in stock. If not, you could use chalkboard vinyl or paper and cut our your own shape or design. Trim your scrapbook paper to the size of the board and use adhesive or mod podge to attach. Now you have a pretty wood sign with only 5 minutes of work. 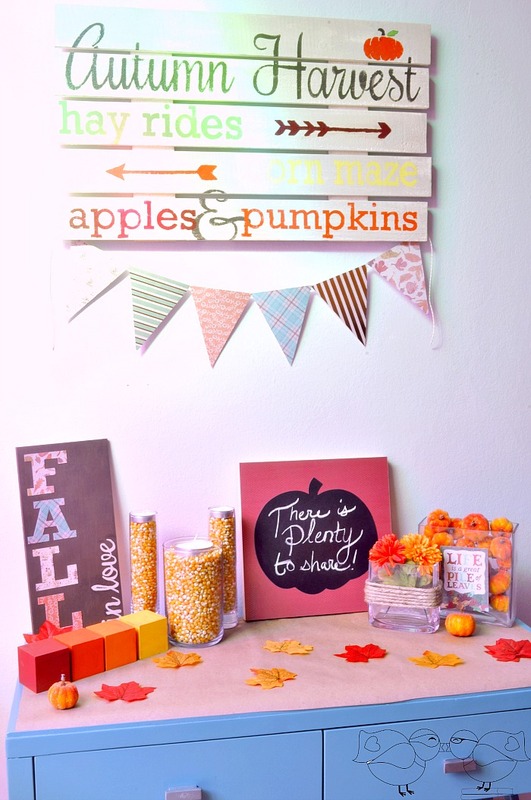 Add the pumpkin to the top of the paper using adhesive or mod podge. 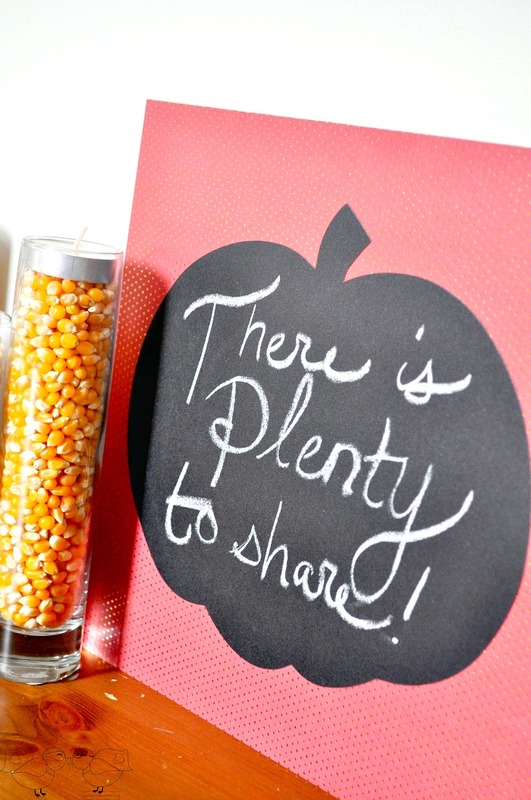 Add your own phrase or flourish with chalk or a chalkboard marker. I wanted a very natural look, so I used my regular old hand writing. If you want it a bit more polished, create a stencil for your quote. I love that the quote can be switched out during the season if you choose. For example, a spookier quote for Halloween or “thankful” for Thanksgiving. I will be honest – I really thought this one might not work. As I was crafting, I was having a hard time seeing the final product. My main concern was that I thought the paper might look hokey or cheap. I am so happy I kept going though because I love it! Paint the board your main color. For me, it was a dark brown. I wanted a bit of texture to my board so it wasn’t a flat background color, so I used an accent metallic color that complimented the dark brown. I sponged just a little bit of the color all over the board and then I used a large, hard bristle brush to rub that color in. I was pretty harsh on the board during this process because my goal was not to have an even layer of color. There is no perfect with this step. I just wanted the texture and depth. While the paint was drying, I cut out “FALL” in 4 coordinating papers. I used my Silhouette Cameo to size the letters and cut them out. 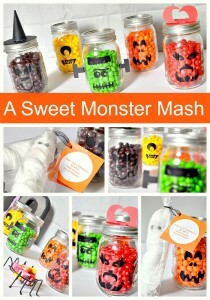 You could easily do this with stencils or by hand if you do not have a Silhouette. When the board was completely dry. 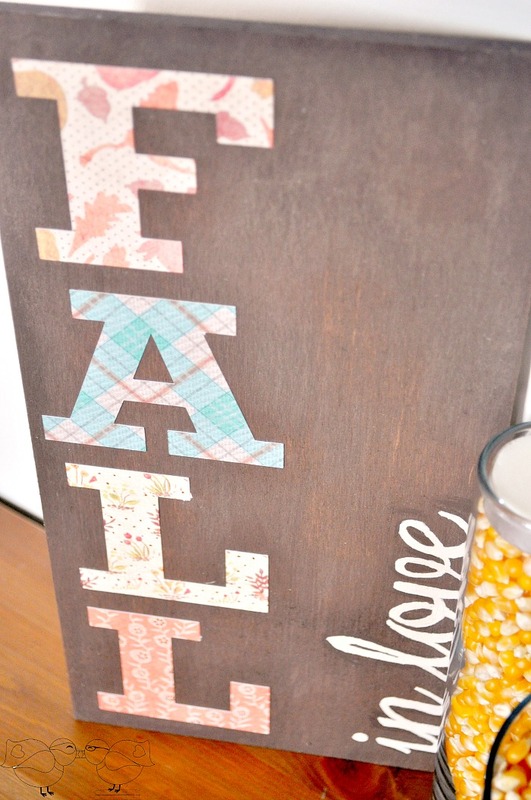 I used a small paint brush to add a layer of mod podge to the back of a letter and then placed it on the board. Without rubbing too hard on the letter (you don’t want to rip the paper), make sure that all the seams are down and everything is smooth. 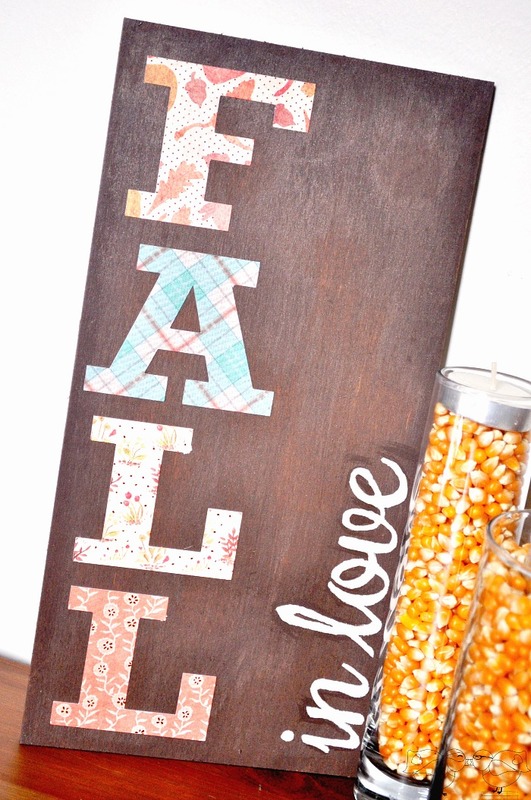 Once all your letters are placed, either hand paint or use a stencil to add your accent phrase. I added “in love” running up the side of the board. I like that the ivory popped against the dark brown and the contrast with the two phrases going in opposite directions. DONE! Didn’t I tell you both of these were simple projects? I just love how all the decor came together this year. 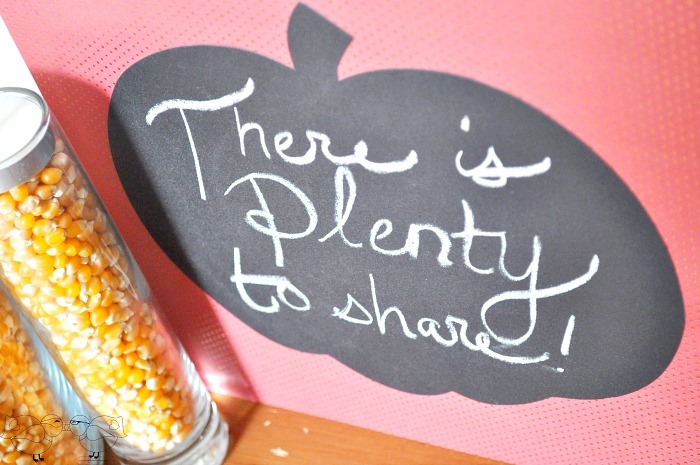 You will see in the photos my vases filled with popcorn kernels, too. It is so easy to just pour those kernels in there and top with a candle, but they are the element I have heard the most praise about. Whether in person or on Instagram, people are loving the vase filler! These are both so cute! 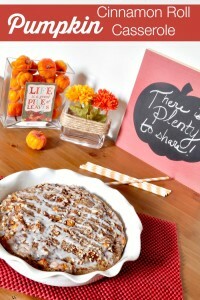 I really love the pumpkin sign and the flexibility to change the quote!